This entry was posted in Health & safety culture on 2017/11/29 by Susan. Many students do seasonal work on winter break. They need answers to safety questions before and after they start. Here are some things they should know. I had great fun with seasonal work on winter break back in my university days. It was at an ice rink, where I was the DJ. I sat in my booth, high above the ice, surrounded by cassette tapes (it was the late 1980s). I announced, through a super-echoey microphone, when it was time to switch direction, partner up, or get off the ice so the Zamboni could do its thing. This winter break, today’s young people will be taking on seasonal work. They’re needed in retail, hospitality, recreation, and more. Lots of other people – not just young workers – are also looking for work. Yet regardless of workers’ industry or age, they have a right to be safe at work. 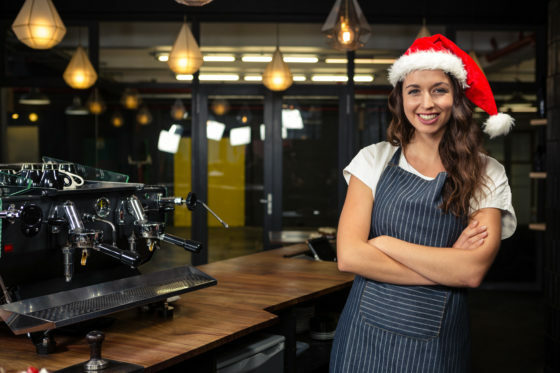 The holiday season can place heavy demands on an employer’s business, but workers’ safety is most important. Think how you would want employers to train your own kids (if you have any) or other young people in your lives. Three basic health and safety rights of workers in B.C. Please share the information below with young people you know. (Not as easy as it may sound! You may need to think how to make it enticing.) It’s from the brochure Getting a Job? Ask questions about safety. It can also be good to ask questions about safety during an interview. Here are a few examples from the brochure. What safety training and orientation will I get before I start work? What safety hazards does the job involve? Will I be trained in how to prevent injuries? If I’m injured at work, what’s the procedure? Getting a Job? has lots more information, including suggestions on how to ask for help if you’re not sure how to do something safely.